Google Play celebrates 25 billion downloads | Android Blast! Google is celebrating a big milestone for their app store, Google Play. 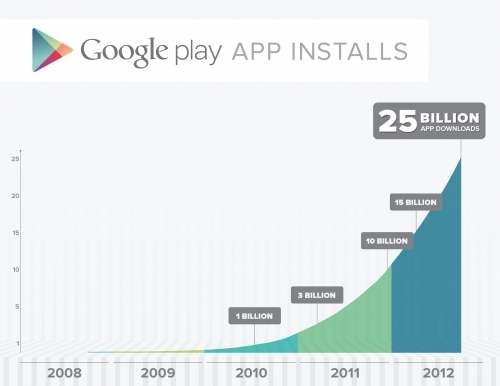 The Google Play Store has reached 25 billion downloads since its inception in 2008. They store boasts 675,000 apps that have been downloaded over 25 billion times. To celebrate the milestone Google is offering some popular apps for $.25 for the next 5 days. Every day you�ll be able to choose from a collection of apps from some of the world�s top developers including Gameloft, Electronic Arts, Rovio, runtastic, Full Fat and more. And all for just 25 cents. We�ll also be offering some special collections like 25 movies you must own, 25 banned books, 25 albums that changed the world and our 25 top selling magazines, all at special prices. Visit Google Play a little later today to check them out. It is amazing how fast Google reached this milestone. It seems like just yesterday when Android was in its infancy and Apple had all the apps. These days most of the major apps are on both iOS and Android so Android has definitely arrived.